FSAE shows preference to member properties. 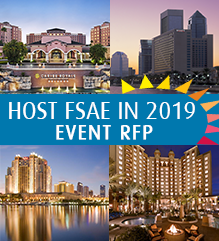 If you are interested in hosting an FSAE event that brings members to your location, please complete the RFP by September 28 to be considered. Thank you for supporting FSAE! Comments on "FSAE is Seeking Locations for 2019 Events"